Before the end of the school year, local history librarians Sonia Schoenfield and Jenny Barry were invited to speak to the third grade students at Copeland Manor School. Each spring the third grade completes units on the history of Chicago including the Great Chicago Fire and how transportation impacted the growth of Chicago and the growth of the suburbs. Ms. Schoenfield and Ms. Barry accepted the challenge to show that Libertyville’s growth was driven by many of the same factors. See if you can find the similarities between the developments of the two towns. The third graders at Copeland sure did! 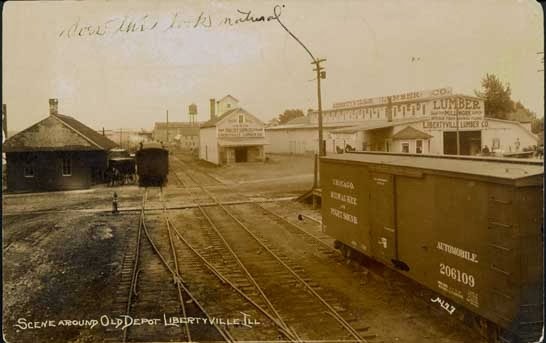 Between 1880 and 1890, the population of Libertyville doubled! Why? 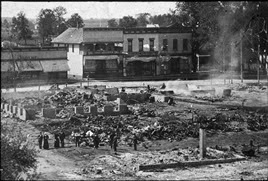 In 1895 an entire block of downtown Libertyville had to be rebuilt. Why? Cigar maker Max LeBeau was up late working to finish cigar orders. Around midnight, Max rose from his chair, walked to the front of his shop and looked out the window. What he saw sent a cold chill up his spine. Huge flames were leaping skyward in back of Schanck’s Hardware store on the corner of Sprague (now Cook) and Milwaukee (Rolland’s Jewelers, across from Picnic Basket). Max called “Fire! Fire!” rousing many people from their sleep. Bucket brigades quickly formed because there was no fire department. Despite the efforts of the people carrying buckets, and primarily because of a lack of a readily available water supply, fighting the fire proved a losing battle. What started at Sprague Street ended one block north at High Street (School Street today). 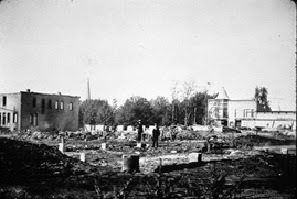 Buildings on the west side of Milwaukee were untouched, but on the east side, 27 frame buildings were completely destroyed. Between 1890 and 1900 the population of Libertyville grew by over 50% from 550 to 846 residents. 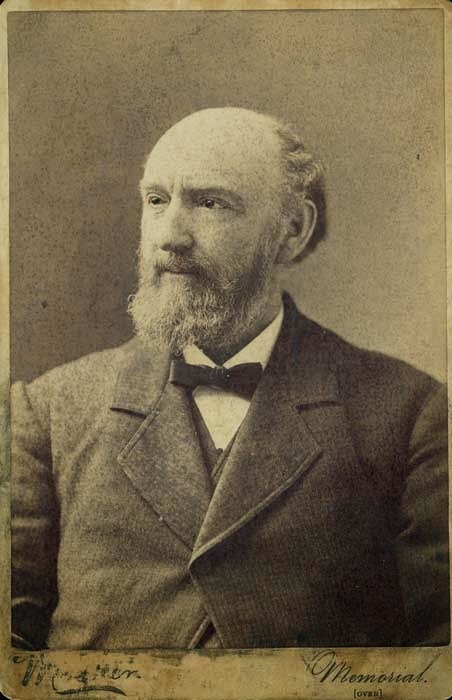 One of the only buildings standing after the Great Chicago Fire was the Water Tower of which the masonry was done by Libertyville’s own Ansel B. Cook. Stay tuned for a look at the 1920’s and post-WWII Libertyville population booms in our next post. ← Wet or Dry in Libertyville?